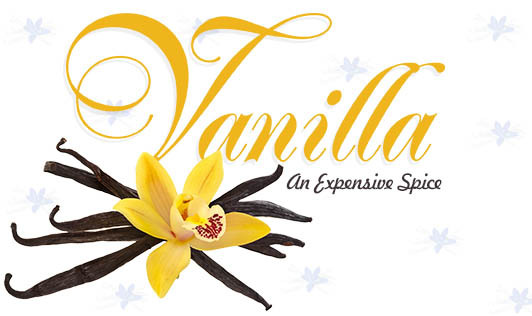 Vanilla belongs to the class of flavor orchids which dates back in origin to 1520. It is the second most expensive spice available after saffron and is widely grown in Mexico, Central America, and some parts of South India. Due to its aromatic flavor it is extensively used in the food industry, perfume manufacture, and in aroma therapy. Vanilla is also very rich in niacin, pantothenic acid, thiamin, and beta vitamins that aid in controlling the body metabolism, helping in enzyme synthesis, and nervous system function. Vanilla contains iron, potassium, calcium, manganese, and zinc, micronutrients necessary for the human body. Potassium helps control the heart rate and blood pressure. Iron helps in improving the hemoglobin content and is known for its role in improving the production of red blood cells. Vanilla can be consumed during pregnancy which helps to maintain the neural balance of the mother and the baby and it has no adverse side effects on the body. Vanilla beans due to their aromatic odor are used in the manufacture of a wide variety of perfumes The extract is used in the food industry in the manufacture of ice creams, chocolates, oils, biscuits, desserts, puddings, and sugars.